In the first and 2nd movies the super-hot Kiera Knightly is the daughter of Weatherby Swann, the Governor of Port Royal, a British base in the Caribbean, and seems destined to marry a bland british dude. 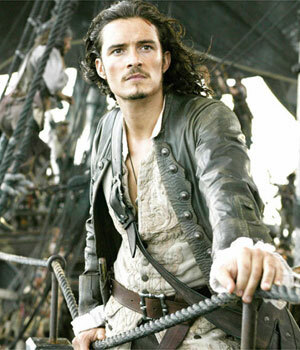 At the age of 12 she removes a key from a shipwrecked Will Turner (protecting him from being accused of piracy). Today, at the age of 20, in Port Royal, she is kidnapped by the pirate Barbossa because it is believed her blood can free Barbossa and his crew from the curse of the Black Pearl. And she truly loves the young swordsmith Will Turner. Her boyfriend Will, with the help of Jack Sparrow track her down, rescue her, release the curse and then kill Barbossa, and then return home. Once home she’s about to get married to Will and is instead arrested for helping Captain Jack. However, their lives will be spared if Will can find Captain Jack and take possession of a the special compass. Escaping from jail, she travels the seas and finds Jack in another port and learns of Davy Jones’ capture of Will (thanks to Jack). Jack also reveals the his compass’ secret to Elizabeth; it points to what the holder wants most in the world. When he convinces her that she can save Will by finding the chest containing Davy Jones’ heart, she gets a bearing towards it. Once the ship is underway, tension arises between Jack and Elizabeth when each discovers the compass now points to the other. They eventually find the heart but the British gain possession of it. As they leave the island, their ship is attacked by the Kraken. Realizing the Kraken is only hunting Jack, Elizabeth slyly kisses him while handcuffing him to the mast. Racked with guilt over her deceit, she tells the others Jack chose to remain behind, unaware Will witnessed the scene and now believes she loves Sparrow. We first see him stranded on an island and learn that he has a deep hatred for Capt. Barbossa (Rush), who led a mutiny aboard Sparrow’s ship, The Black Pearl. Seeking revenge, Jack steals a ship and finds a new crew of his own, including Will Turner, to pursue Barbossa. With the help of Elizabeth and Will, he both releases the Barbossa’s curse and then kills him. After killing Barbossa, he escapes the island and is shortly after captured and taken hostage by cannibals on a remote island. 13 years before this all happened, Jack made a deal with Davy Jones that if Jones resurrected the Black Pearl and made Jack its captain, Jack would then serve about Jones’ ship (The Flying Dutchman) for 100 years. Not wanting to do this, Jack then begins to look for the Dead Man’s Chest which contains Davy Jones’ beating heart. When the pain of lost love became too much to bear, Jones carved the heart from his chest, burying it in a secret location. Whoever possesses the heart controls Davy Jones, thereby controlling the world’s oceans. Back at sea, the Flying Dutchman encounters Sparrow, who deviously attempts to barter Will in exchange for himself. But Jones demands 100 souls in 3 days and takes Will as collateral. So, Jack finds Elizabeth and uses her with the compass to find & get Davy’s heart (and save Will in the process). They find the heart but ultimately lose it to the British. The Pearl is then found by Jones and attacked by The Kraken. Jack gives the order to abandon ship before the Kraken makes its final assault. ‎Realizing the Kraken is only hunting Jack, a deceptive Elizabeth passionately kisses him while handcuffing him to the mast. Jack bravely charges the Kraken, but the colossal beast drags him and the Pearl to a watery grave. Watching from his ship, Davy Jones declares their debt settled. Will is a young swordsmith in Port Royal. His dad, “Bootstrap Bill” was a pirate on the Black Pearl with Jack Sparrow and Barbossa. As pirates they stole a chest of gold and spent it. This brought on a curse that left all of them as Undead until each coin and a drop of blood from each pirate is placed back into the chest. After Barbossa abandoned Jack, Bill complained so Barbossa killed him. Before Bootstap Bill died he gave one of his pieces of gold (the medallion) to Will. Jack figured this out brought Will to Barbossa as his blood could be used in lieu of Bill’s. Will manages to wriggle out of the trap and returns his medallion and gives his blood only after Barbassa has been shot, so he the curse will be released, he will be mortal and thus actually die. Will then returns home with his true love, Elizabeth. Once home he’s about to get married and is instead arrested for helping Jack. The British bastards will spare his (and Elizabeth’s) life if he can find Captain Jack and take possession of Jack’s special compass. While looking for Jack he learns that his father is on the boat of Davy Jones. Will succeeds in finding Jack but Jack attempts to trade him to Davy Jones in exchange for Jack’s 100 year servitude. Instead, Jones takes Will as a hostage until Jack returns in 3 days with 100 souls. Will escapes from the Dutchman with help from his father, and arrives on the island containing Davy’s heart with the key to the chest (containing the heart) that he stole from Davy Jones. Will wants to stab the heart to free his father, but a three-way duel erupts instead and the British get the heart. Will then escapes on the Black Pearl. But Jones is chasing the Pearl to get Jack Sparrow. As the Kraken is attacking The Pearl, a deceptive Elizabeth passionately kisses Jack while handcuffing him to the mast. She tells the others Jack chose to remain behind, but Will witnesses the scene and now believes she loves Sparrow. He and the crew of The Black Pearl stole a chest of ancient gold. He first led a mutiny aboard The Black Pearl and leaves Jack on a deserted island. It turns out the gold is cursed and it turned the entire crew into the Undead. By day they look like normal if dissolute humans, but by the light of the moon, they’re revealed as skeletal cadavers. Because they’re already dead, they cannot be killed (however they continue to fight people throughout all of the first film – don’t ask me why). To reverse the curse, they need to place all the coins back and a drop of blood from each pirate into the Dead Man’s Chest. Bill Turner is already dead, but Elizabeth says her last name is turns so Barbossa kidnaps her. Barbossa tries to use Elizabeth, but Will rescues her. Jack then informs Barbossa who Will is and during the fighting Will and Jack end up killing Barbossa. Cursed to roam the sea for centuries, Jones has a serious score to settle with ol’ Jack Sparrow — and he has a pretty nifty arsenal at his disposal. In addition to his undead ghost ship and a bunch of amazingly nasty sidekicks, Jones keeps a multi-tentacled water pet which can engulf any ship on in a spectacular fashion. Jones was once in love with a woman but she was lost to him. Because this pain of lost love became too much to bear, he carved the heart from his chest, and buried it in a secret location. Whoever possesses the heart controls Davy Jones, thereby controlling the world’s oceans. Jack wants to control the heart so he doesn’t have to spend 100 years on the Flying Dutchman. But, the heart falls into the hands of the British and Jones chases down Jack. Not able to take over The Pearl, he summons the Kraken who takes Jack down to the depths of the ocean. There are some other characters, but knowing these should get your through the 3rd installment. Enjoy….